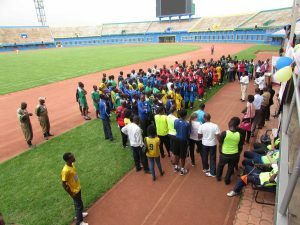 Isobel Blakeley, a volunteer for VSO who has been working with Chance for Childhood for the last year, reports back on her trip to see the first ever National Deaf Sports competition in Rwanda. I awoke early with a mixture of excitement and trepidation. I had been looking forward to this day for months, would everything go smoothly? Would it be a success? 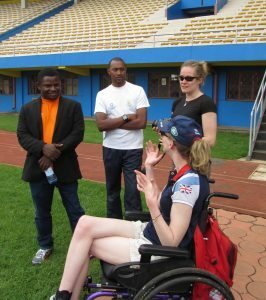 NPC (National Paralympic Committee of Rwanda) had taken over the organisation of the event,- much to my relief – but as I had not worked with them before, I did not know how efficiently they would organise the day. I need not have worried. Celestin is a master of organisation,and a very nice man. Celestin (NPC President) , Jean Baptiste (NPC), Helen, Sophie’s aide, and Sophie. Sophie Christiansen, Patron of Chance for Childhood and Paralympic gold medallist, had been met at the airport on Saturday by TV journalists, and she had also had an hour long press conference the day before the event, which had been well attended, so all of the preparations were in place. Registration was from 9am, and the events were to start at ten. 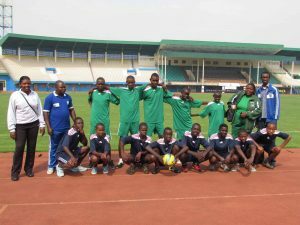 We arrived at the Stadium, (a 15 minute walk from the house I stay in in Kigali) just before 9, to find that two schools had already arrived. The group from Umutara was one of them. Dominique looked the part in his blue track suit. They had set out at 4.30 in the morning, to make sure that they arrived on time, (plus extra time for mishaps) and were anxiously summing up the other team! Gradually the other teams arrived – the team from Nyange being the last arriving about 9.50am, as they had been stopped several times by traffic police on the way – an occupational hazard when driving in Rwanda! All of the teams looked great in their kits, some of which I know had been begged and borrowed! These were the football groups. My loyalties were divided! In group A, I wanted both Nyagatare and Nyabihu to win! In group B, I wanted Musanze (Nyange) to win. 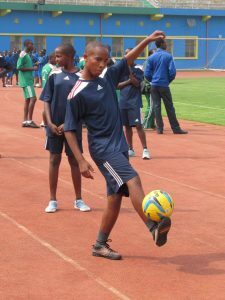 A boy from Umutara practicing his skills before the match. There was fierce competition and great energy employed. It was exciting to watch the matches, two being played at a time. The full sized pitch was divided into two smaller pitches and the goals were very small. I have never seen this before, but it definitely encouraged accuracy in shooting! Each team consisted of 8 pupils, two of whom had to be girls. There was no goal keeper. Watching deaf football is strange. There are flags instead of whistles, and very little sound! Nobody is shouting instructions from the side lines. When a goal is scored – they wave their hands in excitement, and run around hugging each other just like on the telly! Action on the pitch – Nyabihu ( not Cambridge United) playing here. Nyabihu were the winners of Group A and Huye of Group B. So we came to the final. Unfortunately, I think the Nyabihu players were exhausted by this time, and just could not seem to play their best – it was a close game, but they lost the match, Huye managing to score one goal. In the three qualifying matches, Nyabihu had scored a total of 10 goals, but in the final, they just could not seem to get one through. They looked so disappointed. We were thrilled that they had done so well, and I think they will realise that later, but at the moment of losing, they were so disappointed! 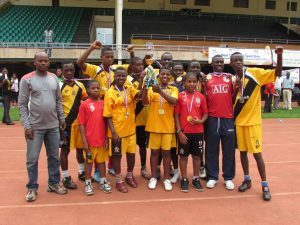 So the winning team – Huye,- received the trophy and a gold medal each. 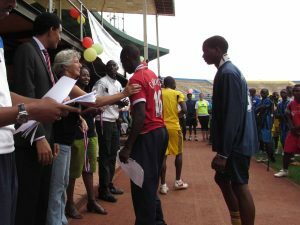 The Nyabihu players received a silver medal each and the third team, Nyanze, bronze medals. The athletics events took place at the same time as the football. There were races for girls and for boys. Each pupil could enter two races of their choice. Huye team – football champions! The distances were 100m, 200m, 400m, and 800m. Some of the events had heats as there were too many entrants for one race. There were medals again for the fastest three. The school that achieved the most medals again had a trophy, and this time Nyabihu came first, wining 7 medals, way ahead of the second place Rulindo who had 4. By 2pm the events were over. The weather had been good, coolish in the morning, but hotting up after 12. By 2 it had clouded over again, but didn’t rain until just after the award ceremony had finished! 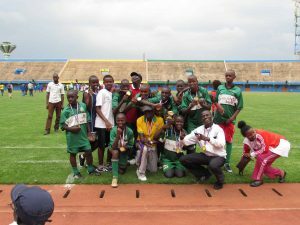 Nyabihu team with their football medals, the Athletics cup and athletics medals. NPC had invited some important people to the event. Gaston, the MP for disability was there, and spent a lot of time talking with Sophie. Marcus from the British High Commission, who I met on my first week in Rwanda, was also present, as well as The Child Protection Officer from UNICEF, and Anna-mai Estrella, the Executive Director of Chance for Childhood, who were the main funder of the event, to name a few. I was there as instigator of the event, and representative of VSO, who also made a contribution towards the costs. My sister, who was visiting was also treated as a VIP! A close finish – and I found out how hard it is to photograph fast runners! I had the privilege of handing out some of the medals! It was also amazing to meet Sophie – I had never stood so close to an Olympic gold medallist before! What an inspirational woman! She was only in Rwanda for 6 days, but had a punishing schedule, meeting many disabled people, and discussing with everyone she could, the rights of people with Cerebral Palsy – her particular disability, – as well as championing the cause of neglected deaf children in Rwanda. I shall be glued to the tv for the next Paralympics – cheering her on to more golds! All of the contestants (112 children and their teachers) listening to their MP. He is championing the rights of people with disability, to have full access to education, sport and employment. Sign language translation provided by RNUD. Rwandan National Union for the Deaf. After the medals ceremony, everyone went to eat. Then it was the long journey home for all of the teams. It always seems so flat after an event like that, especially when most people don’t win – but on reflection, I am sure that all of the children will remember the day with great excitement. 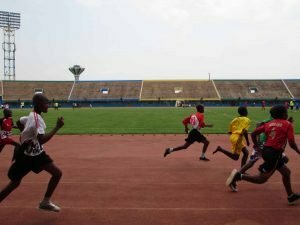 They day they played football on the pitch of their national stadium, or ran on the same athletics track as their national runners. Of course, that is the question in all of our minds! Eric, the athletics coach at the stadium, has promised that all of the athletes who won medals, will be followed up in order to train them for the next Deaflympics in 2017. If this happens, it will be the first time that Rwanda has been represented in this world class competition. Also, we would like to make this Deaf Sports Day an annual event – but to include more pupils and perhaps more sports. To do this, we will need to organise regional competitions, and then the winners in each region would come to Kigali for the finals. NPC have shown that they can organise events like this very well. The only problem is the old, old problem. – funding! Awarding a silver medal to one of the runners. So – if any of you are particularly interested in sport, in deaf sports in particular, or know of any organisation that might be keen to partner us in the next phase of this enterprise, then please contact me! Presentation time.Left to right – Sophie, Marcus, Anna-mai, me, my sister and Innocent – C4C colleague and translator. PS – any of you old enough to remember Zola Budd? I was reminded of her as some of the children threw off their shoes to run in bare feet!